Wow. Three home wins in a row now and playing some fantastic stuff. Each week I've been quietly confident but also worried as much by the reputation of the opponents as their actual ability but every week that goes by further proves that this team has more than enough to stay in this division. 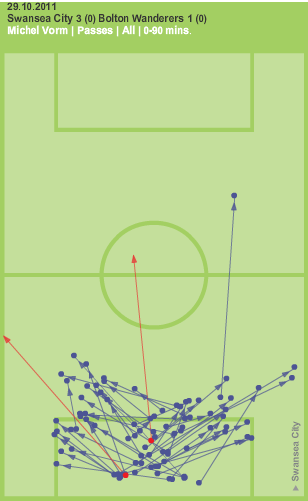 The top level stats are pretty impressive: 3 Goals, 23 Attempts in total (best this season) and 652 completed passes. 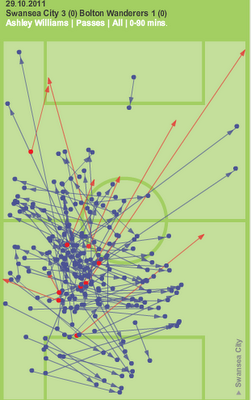 Swansea's 602 open play passes dwarfing Bolton's figure of 227. The goal so soon after the sending off obviously had a huge impact on the game but throughout I found Bolton's approach quite strange. They pressed our defence at times but only with one or two players at a time. Pass - Pass - Pass and suddenly the balls with a Swans player in plenty of space. With that level of control, the top two passers were Williams and Monk. Williams in particular showed an impressive range of passing and it's great to have a centre back who is comfortable pushing up towards midfield when the situation allows, this commits the opposition midfield creating space for the Swansea midfield. 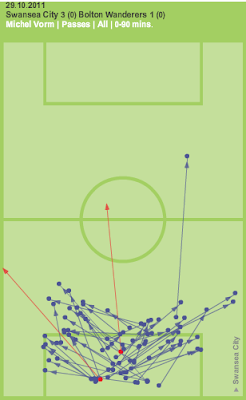 In total Williams made a huge total of passes (121) with only 9 being unsuccessful. ﻿Another example of Bolton's lack of pressure can be seen in Vorm's kicking where there were only 2 Unsuccessful passes all game, one of which was an unfortunate slice out of play when under no real pressure. Bolton's half hearted pressing meant that there was usually a straightforward pass on for Vorm. Special mention has to go out again to both﻿﻿ Joe Allen and Leon Britton who between them made 152 passes with only 1 pass going astray with Leon making 67 passes, all successful.